This dessert is all about presentation, aka dumping the ingredients into the wine glasses (or whatever containers you want to use as your food vehicle). Start with a small dollop of pudding on the bottom. Add a layer (I like this one thick) of the cubed cake. Add another layer of pudding on top of that, then a layer of sliced bananas. Pile on some graham crackers, another layer of pudding, and some more sliced bananas. Top with whipped cream, if desired. Voila! 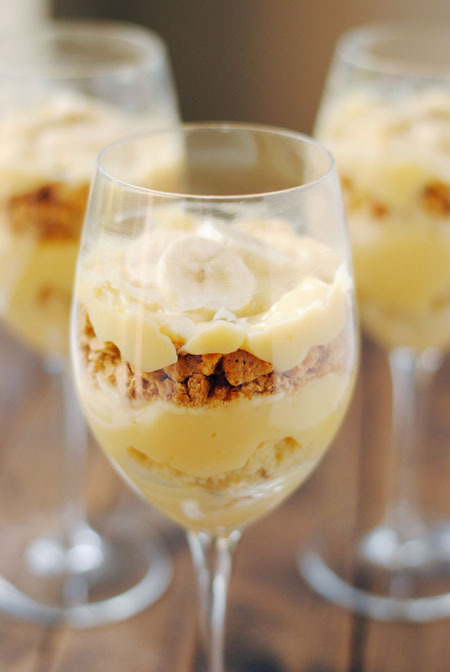 And easy, breezy, deconstructed banana cream pie trifle.